…than to cancel it. Kinda weird, but there you have it. With my job change and such, we’re trying to cost unnecessary costs. And since we can watch our favorite shows through CBS or Fox online, we don’t need cable tv (oh, and we get the Fox shows through regular tv anyway; CBS is a little fuzzy, but then cable CBS is too). So Micah called up the cable company. When he asked to cancel it, he found out that canceling our cable tv could double our bill for internet. We’re getting special savings because we signed up for them together. But if we cancel the cable, we lose the special savings on the internet. And with his teaching job, our blogging, and my plans of finding freelance work online, that’s not really an option. So there you have it. Apparently the obvious choice isn’t always the frugal one. Of course, we’re monitoring our bills to find out when the special ends and then we’ll reevaluate. It is actually very similar for us – our cable, internet, and phone (land line) are all at one special rate right now that if we eliminated the cable, the rate for the other two would be higher than it is now for all three. Having worked for the cable company, I would suggest that you contact them back (talk to retention again) and find out if they have any promotions for 3-6months on the internet that would work for you. 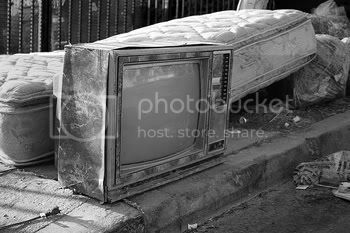 But you may be right – getting local/basic tv may be the best deal over the long haul. The key to getting deals from Comcast and other cable companies is to call repeatedly and threaten to cancel to solicit better offers. I haven’t had television reception of any kind for two years. I’m switching internet/phone service providers as soon as my one year contract is up (April), and I might very well end up with cable from the new provider I’m looking at for the very same reason. One thing I’ll have to check out in this area, Raymond, is the other providers. When we moved in we found it was pretty much a Comcast monopoly. But we could always threaten Dish, I suppose. I work for the BIGGEST cable company. (We don’t need to mention names, do we?) They have it set up so that if you get internet in connection with any other service, you get a discount. So even if you drop your cable tv down to Just Basic Service, whatever the cheapest cable package is in your area, you’ll get a discount on the internet. Usually you can get basic cable plus internet at the same or less than the cost of getting internet alone.